In Ancient Times, a Clan Chief wore into battle a distinguishing badge on his helmet ... a device which his followers could recognize in the heat of battle. This is known as the CREST OF THE CHIEF and appears at the top of his Full Coat of Arms. Anyone bearing the same name as a Scottish Chief is a Clansman of the Chief and has the privilege of wearing his CREST surrounded by a STRAP AND BUCKLE GARTER to denote his Clan allegiance. The great Scottish Clans included families who bore a different surname but were descended from the Chief through the female line. They are called SEPTS. 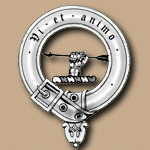 Therefore anyone who has an ancestor bearing a Sept name or the Clan name itself has the privilege of wearing or displaying the Crest Badge and only they may legitimately wear this authentic ancient Scottish device.